We are diehard fans of music and want a website that honors the musician's on tour and supports our community with valuable information. JBF wants to make it easy for fans to live on the road. Soon you will be seeing the JBF booth at festivals, shows and concerts all across the nation. Jam Band Friendly welcomes any stories, articles, funny encounters or random tidbits from the road. We will also post a band’s bio and show dates that you think the JBF community would benefit from. 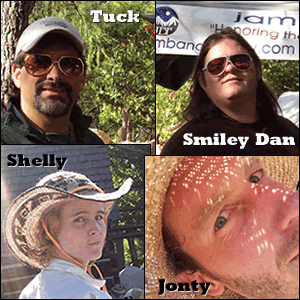 JamBandFriendly.com started in a hotel room at 4am in 2005, but didn’t come to fruition until 2010 when Daniel Marks “Smiley Dan” and Andrew Tuckman “Tuck” decided that JBF needed to happen. They felt the community needed something online that could be a place to visit, see photos, read articles, learn about bands, find out who is playing around the country and where to stay when you got there.